Aung San Suu Kyi, Nobel Peace laureate and Myanmar's democracy hero needs no elaborate description, as she has already managed to capture a place of honor in many of our hearts despite where we come from. To put it simply Aung San Suu Kyi is one of those few people that we have come to recognize as a symbol of democracy and freedom. Father: Burma's Independence hero, General Aung San who was murdered by his rivals two months before independence and Daw Khin Kyi, former ambassador of Burma in India are her parents. She grew up with her two brothers in Yangon and India. 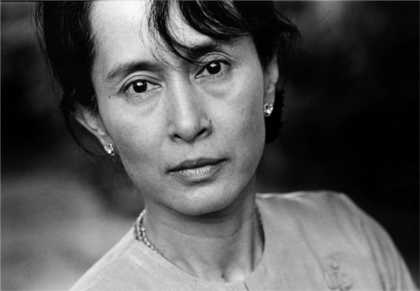 Education: She had her primary and secondary education in Burma and India and Tertiary education in the UK. Graduated from Oxford University after following a B.A degree in Philosophy, Economics and Politics. Spouse: Her husband is Michael Aris, a Tibet scholar she met at Oxford. They got married in 1972 and became proud parents of two sons, Alexander and Kim. Awards: Sakharov Prize for freedom of thought in 1990, The Nobel Peace Prize in 1991, Jawaharlal Nehru award for International Understanding in 1992 by the government of India, International Simon Bolivar Prize from the government of Venezuela and the US Congressional Gold Medal awarded by the government of USA. 1988 Returned to Burma to look after her sick mother. Became an activist in the nationwide democracy rebellion against the iron rule of the military regime. Was appointed as the General Secretary of the pro-democracy party, the National League for Democracy which was founded on 24th September 1988 after a military coup on 18th September 1988. She started delivering public speeches on democracy and freedom. 1990 Due to international and domestic pressure the military government held a general election and under dire conditions her party, NLD won 82% of the seats in parliament which was not recognized by the dictatorship and refused to hand over power. Aung San Suu Kyi was put under house arrest until July 1995, in order to suppress her freedom fight. 1995 She was released from house arrest in July but she was restricted from traveling. 1999 On March 27th Michael Aris, her husband died of cancer in London. It was sad to know that the last time he saw her was in 1995, when he came for a Christmas visit. Her husband's petitions to the Burmese government on getting permission to visit her one last time was declined. Though she had the chance of joining her family in London, she continued to live in Burma as she very well knew that if she left Burma she would never be allowed to enter her country again. 2000 After her repeated attempts to leave Rangoon to meet her party supporters and spread the message of democracy through political meetings, she was placed under house arrest once again. 2002 As a result of a deal that was struck between NLD (Aung San's party) and the military government, after rigorous talks between the two parties, facilitated by Razali Ismail, UN Envoy in Burma, Aung Sang was released from house arrest with freedom to travel any where in the country. 2003 The USDA (Union Solidarity and Development Association, presided by Than Shwe) attempted to assassinate Aung San Suu Kyi by attacking the vehicle that she was traveling in, on May 30th 2003. This was done under pretext of a civilian movement using civilians in order to escape direct blame. She escaped with the help of her driver, but more than 70 of her supporters were beaten to death (This incident became well known as the Depaying Massacre). After the failed attack, she was detained under house arrest once again. She was isolated form all her supporters by cutting her phone line and her postal connection. Even the NLD volunteers who provided security for her at her residence was removed in December 2004. Except for occasional meetings with UN Envoy and the US Government, diplomats were not allowed to visit her. 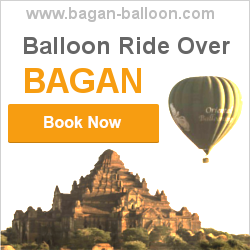 (Even Ban Ki-Moon, UN Secretary General was not allowed to visit her, during his stay in Myanmar in 2009). 2009 Prior to the expiration of her house arrest, she was arrested for breaking the terms of her house arrest. This was mainly due to John Yettaw, a US citizen who refused to leave her compound after having swum across Inya Lake to get there. In August she was found guilty for the charges against her and was sentenced to 3 years imprisonment which was reduced to 18 months in order to pacify the outraged international media and people who were questioning the trial. 2010 Aung San Suu Kyi was released from detention on the 13th of November. 2011 She met Myanmar's president Thein Sein on the 19thof August. 2012 On the 1st of April she won a seat and her party (NLD) won 43 out of 45 seats contested in the by-elections held with the guidance of the current president Thein Sein. On 29th May she traveled outside her country for the first time after 24 years on a visit to Thailand. On 25th of July she made her first speech in Parliament calling for the recognition of ethnic minorities and calling for laws to protect their rights as Burmese Citizens.